Description: Matchmaker is one of the largest online dating sites with significant numbers of single girls and single men available and looking to meet their perfect match and life partners. The website is very popular for connecting people across all of South Africa and you can search by province and city to narrow your selection to those close to you and setting up dates. You can browse through hundreds of photographs of girls looking to find a boyfriend or guys looking to meet girls in your location. You can use it looking for friends online or for your perfect match and life partner. The website is very comfortable to browse through and although you need to join to get full access this only takes a few minutes and costs nothing to arrange a free profile on the site. It is possible then to browse galleries of the most recent 100 photographs uploaded, conduct a detailed search or just find out who is in your neighbourhood. 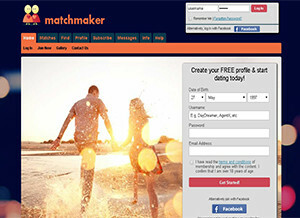 Where matchmaker excels above other online dating websites is in the matching functionality. You can stipulate criteria for the type of person you want to meet and they will run through all their profile not only getting a match by the information you state but also looking at those profiles requirements to match against yours. The principle is that you will then get the person that is not only most like the girl or guy you want to meet but that you are for them. You can pay to upgrade your account to allow private photographs available by invitation only, to allow emailing other members and to increase the number of matches. Other than the mailing facility for people looking for single girls or trying to meet single men, then the subscription may not be something you want to sign up for. The price is in British pounds and ranges from £11.95 for 3 days to £143.95 but converted into Rand at point of payment. Visa, MasterCard and PayPal are all acceptable methods of payment. Ease of use: Very easy to browse around the website and profiles are easy to read with clearly displayed information. There are good information sections with Frequently Asked Question, tips on photographs and policies of the website clearly available. They even allow you to report profile holders who may be abusive. Selection of profiles: The range and number of available profiles is significant and you can search and filter for characteristics that will still leave with good selections of singles online looking for a date or to meet friends. Star rating: 3.5/5. The company has been running for many years and this is a worldwide online dating website with one of the largest selections of profiles available. It operates at a very reasonable cost, or significantly has the majority of its functionality for free and offers profiles and photographs easy to review, consider and contact as you wish. An excellent website for connecting with others. Contact details: Online web form to email, no telephone numbers or physical addresses quoted.